On one side we have CES 2016 going and on the other side we have Xiaomi confirming the launch date of the new Redmi 3. Subscribe via e-mail for CES 2016 and more news. We could say that the Redmi 3 is one of the awaited smartphone of Xiaomi. 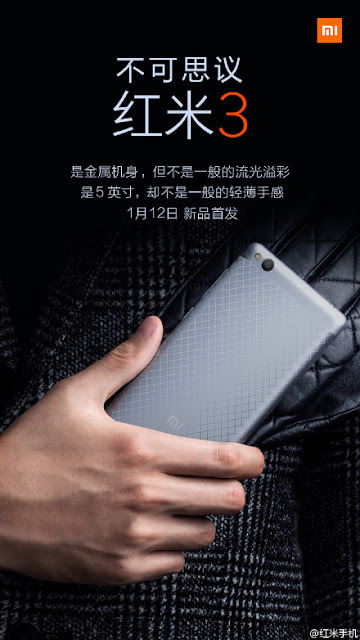 The Redmi 3 is going to launch on January 12. The confirmation came from companies post in Official Weibo account as a teaser. The teaser also revelaed one spec of the device, it sports a 5-inch Display as well as features an all metal body with a unique plaid design on the back. The rest of the specs would be known when the device launches. The device's TENAA listing revealed that it is powered by an Octa-core CPU and the Display will have (1280 x 720 pixel resolution) HD TFT Display. Some other specs reveled which are not official are, 16GB with 2GB memory, 13MP/5MP cameras and Android 5.1.1 Lollipop software. We would keep you updated with the launch and other news of the device, so Subscribe via E-mail.